SANTA CLARITA, CA. 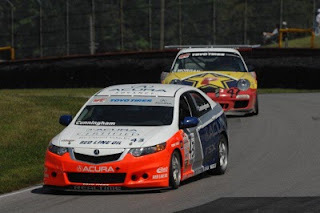 (Sept. 14, 2010) – Records fell by the handful September 11-12 at Virginia International Raceway as Acura and RealTime Racing’s Peter Cunningham clinched the SCCA World Challenge GTS category championships for both manufacturers and drivers. The two GTS wins – by Cunningham on Sunday and teammate Nick Esayian on Saturday – were more than enough to solidify Acura’s position as Manufacturers’ Champion in the inaugural year for the GTS category. Although new to GTS competition, the title is the ninth – and third consecutive – for Acura in the SCCA World Challenge. Acura also won titles in the former T2 class in 1998 and 1999; and in the Touring category in 2000, 2002, 2005, 2006, 2008 and 2009. Cunningham’s drivers’ title is his sixth, a World Challenge record, and his victory on Sunday was his 40th, also extending his series record. Esayian’s victory on Saturday was his first in GTS competition, while North Carolina’s Kevin Helms combined a third [on Saturday] with a fourth-place finish in Sunday’s race in his DBA/Carbotech Acura RSX. 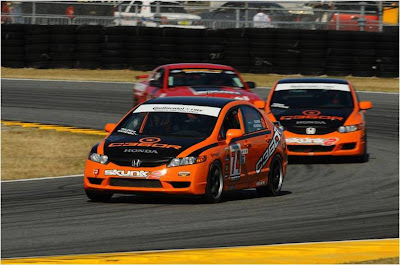 In the Touring Class, series rookie Brett Sandberg finished third in his Acura TSX on Saturday, while Branden Peterson was the top Honda finisher on the weekend, running fourth in Touring Car in his Civic Si on Sunday. The 2010 SCCA World Challenge concludes October 1-3 at Miller Motorsports Park near Salt Lake City, Utah. TOOLE, Utah (Sept. 12, 2010) – For the drivers’ and team championships it came down to a tie-breaker, while the manufacturers’ title chase was just a little less close – seven points – as Honda and Compass360 Racing successfully defended their Street Tuner titles in the Grand-Am Continental Tire Sports Car Challenge season finale at Miller Motorsports Park in Utah. A third-place finish in Saturday’s 200-mile race for the Compass360 duo of Lawson Aschenbach and David Thilenius in the 10th and final round in the 2010 championship saw the pair tie the BimmerWorld team of Bill Heumann and Seth Thomas on points. In addition, both teams tied in class wins (two each) and second-place finishes (also two apiece). But neither had a third-place result – until this weekend. That became the tie-breaker, winning the drivers’ title for Aschenbach and Thilenius and the team crown for Toronto-based Compass360. Honda ended the season with 312 points, to 295 for BMW. 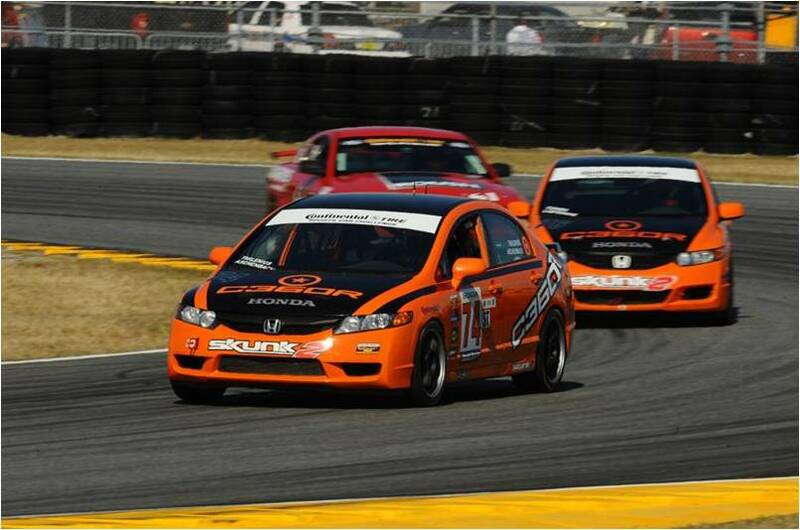 It is the second consecutive ST Manufacturers’ Championship for the Honda Civic Si. VW finished third in the title fight that also saw competitive efforts from Mazda, KIA and Mini. Reflecting the tight championship battle – that saw the points lead swing back-and-forth – the finale at Miller was equally dramatic. 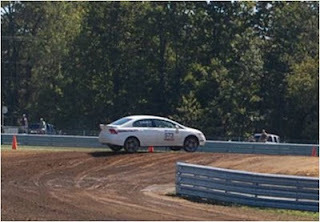 BimmerWorld’s Heumann and Thomas came into the event leading the title fight, but Heumann had to pit his BMW 328i with a broken differential on the second lap and the resulting 30-minute delay for repairs dropped them to an eventual 20th-place finish. With their competition delayed, Aschenbach and Thilenius now needed a finish of third or better in their Skunk2/HPD Honda Civic Si to secure the title. That’s exactly what they accomplished, but only in final minutes of the race. Running fourth at the checkers, just behind their Compass360 teammates, Zach Lutz and Ryan Eversley finished the 2010 season tied for fifth in the drivers’ points race. Their season-long results, in addition to those of Aschenbach and Thilenius, proved to be the difference in the Manufacturers’ Championship contest. TORRANCE, Calif. (August 3, 2010) –Honda Performance Development and American Honda have released details of their support program for Honda and Acura competitors during the 2010 Sports Car Club of America National Championship Runoffs, Sept. 20-26 at Road America in Elkhart Lake, Wisconsin. 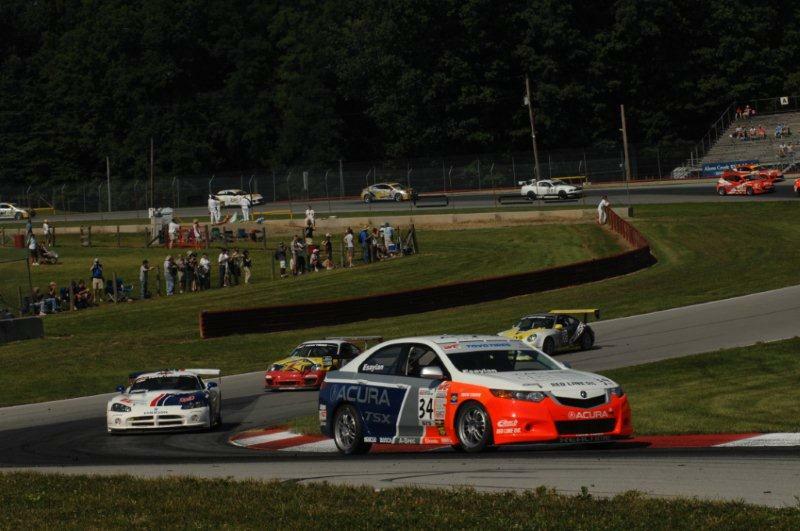 “Our support program for the 2009 SCCA National Championship Runoffs was a critical component of the grassroots motorsports initiative we announced last year,” said Erik Berkman, president of Honda Performance Development, Inc. “We were very gratified by the response we received from Honda- and Acura-powered Runoffs competitors at Road America. · $2500 for winning a National Championship, with additional awards of $1500 and $1000 for second- and third-place finishes, respectively. 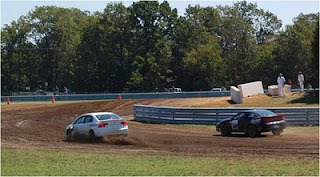 Honda/Acura competitors will be reimbursed with a $100 credit for reserving a paddock parking space at the Runoffs. 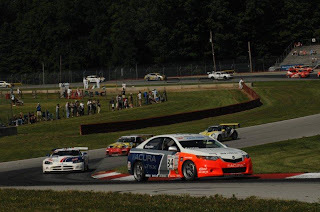 The space must be reserved directly through Road America and prepaid by the competitor. In addition to these benefits, American Honda will provide a catered hospitality tent on site, exclusively for Honda competitors and crew members. The tent will provide a lunch buffet from Tuesday, Sept. 21 through Saturday, Sept. 25. Competitors may pick up their hospitality passes in the Honda Racing paddock at Road America. Honda Performance Development (HPD) is the Honda racing company within North America. Founded in 1993, and located in Santa Clarita, Calif., HPD is the technical operations center for high-performance Honda racing cars and engines. In addition to its grassroots motorsports support programs, HPD is the single engine supplier to the IndyCar Series and competes in prototype sports-car racing under the HPD banner in the American Le Mans and European Le Mans Series. SANTA CLARITA, CA (August 17, 2010) – A pair of victories for RealTime Racing and driver Peter Cunningham at the Mid-Ohio Sports Car Course were enough to clinch Acura’s ninth Manufacturers’ Championship in Sports Car Club of America World Challenge competition, with three rounds remaining in the 2010 series for production-based racing cars. The GTS class victories of Cunningham – his fifth and sixth of the season – extended his series-record career total to 38. Cunningham now has a 164-point drivers’ championship lead over teammate Nick Esayian, who finished second in both Mid-Ohio events. Cunningham led the first race at the classic Mid-Ohio circuit from flag-to-flag on Saturday, but Sunday’s round was a tougher proposition. Next up for SCCA World Challenge competitors will be another doubleheader weekend, the SCCA Pro Racing Sports Car Wars, Sept. 10-12 at Virginia International Raceway.